In some cases, receiving a new set of dentures in Mishawaka takes place over multiple steps. During your denture consultation, your dentist may measure your mouth or craft an impression of your bite. This ensures that your new denture replicates your natural jaw function. Any diseased teeth will need to be removed before you receive your permanent denture, and those receiving an implant-supported appliance will require a dental implant procedure. Once you’ve fully recovered from any dental work, your dentist will fit and adjust your new denture. Every person has unique dental challenges; because of this, several types of dentures are available. 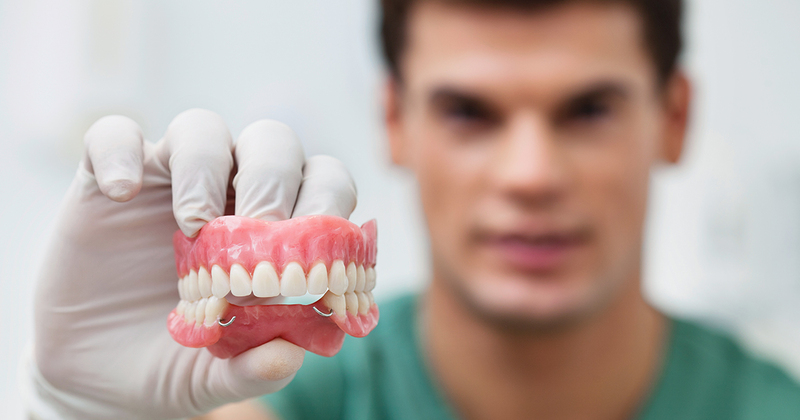 Call us now to explore your options for affordable quality dentures. Sometimes referred to as a complete denture, a full denture restores an entire row of teeth in the upper or lower jaw. A full denture can rest along the gum line or be secured in place using dental implants. These durable appliances are made with natural-looking porcelain and acrylic. Tooth extractions may be required if a full denture is selected. Partial dentures are an excellent choice for those who have several natural teeth that are in good condition. These appliances work much like a bridge, using a clasp system to attach the row of pontic teeth. Like a removable full denture, you can remove the partial for nightly cleanings. A flexible partial is constructed using pliable, natural-looking materials. Unlike traditional partial dentures, flexible partials utilize gum-colored clasps to stay in place. They are virtually invisible when worn, making them a discreet and convenient way to replace missing teeth. If you have retained enough bone to support dental implants, an implant-supported denture may be right for you. These dentures are placed in the mouth using two to four dental implants. Implant-supported dentures can be removable or permanently attached. When it comes to receiving dental care, every person is different. The cost of dentures varies widely and will depend on the condition of your teeth and gums and the kind of denture chosen. If you’d like to explore your denture options and receive an estimate for services, call us now to make an appointment. Dentures in Mishawaka are custom-made dental appliances that can replace a full arch of teeth. They are created using several durable materials and can be removable or fixed into place. When you choose denture treatment, you can reclaim your smile and improve your facial structure. Call us now for more information. Why Is a Soft Denture Reline Sometimes Necessary? Denture wear can sometimes lead to uncomfortable spots in the mouth. Fortunately, a soft reline from our dentists may help. During a reline, the dentist adds a soft material to the base of the appliance. Soft relines remain pliable for up to two years. If you’re looking for a permanent solution for missing teeth, All-on-Four dentures may be right for you. This technique involves the dentist securing a full set of teeth to just four dental implants. This creates excellent biting power and great stability. To learn more about this unique denture option, please give us a call.